These studies are making progress in finding treatments for epilepsy. In the study, “Researchers identify new genetic cause of epilepsy” researchers used whole genome sequencing to pinpoint a mutation in a young patient with a severe and rare form of epilepsy. They discovered a mutation in KCNB1 gene which helps to regulate the flow of potassium ions. Before these findings, treatment for the patient seemed hopeless, but with the finding of this mutation, new treatment options have opened up. The patient’s prognosis is looking up and her physician is optimistic. In the study, “Genetics of the epilepsies: where are we and where are we going?” researchers focus on gene discovery in monogenic epilepsies, along with risk genes in complex genetic epilepsies and pharmacogenomics. Massive parallel sequencing technologies are being used to look into familial and de novo epilepsies. There are many types of epilepsies, making research difficult. Research is conducted through familial and twin studies, but because epilepsies are not inherited in a monogenic fashion, it is hard to find large cohorts for association studies. Pharmacogenomics has seen progress but is investigating forward into genetic markers associated with the side effects to antiepileptic drugs. The above photo shows two different EEGs; the top shows normal brain activity and the bottom shows abnormal brain activity. 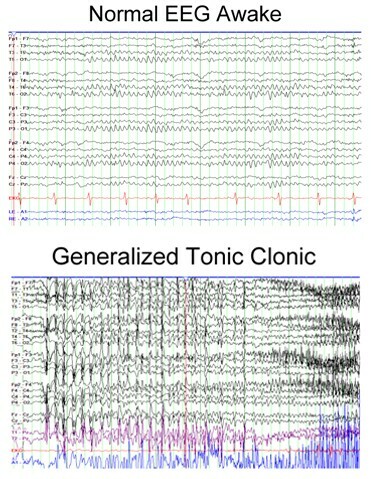 Tonic-clonic seizures are the generalized, what most people think of, as seizures. Also known as grand mal seizures, the individual's body will contract, extend, and shake, leaving him sleepy, achy, and/or with a headache. How is it important to the medical community? Epilepsy is very prevalent among patients today. There are many types of epilepsies that range from rare and severe to infrequent and mild. It is so important to be making headway in this field because so many patients deal with seizures everyday and still have no cure. Treatment and side effects of antiepileptic drugs can be harsh. The benefits of one discovery reach far beyond just one case. These findings to treat one type can be used as a model to treat other types. They can help direct the discoveries of new drugs and treatments. How is it important to the nursing community? New findings in the vast field of epilepsy are important in the nursing world. Nurses will encounter many patients with epilepsy and should be aware of the newest research in order the treat their patients with the best care. Nurses will spend a lot of time with patients who have seizures that may not be the primary diagnosis; they could be secondary or a side effect. Epilepsy does not have a well-defined treatment plan, and with the latest research a nurse can advocate for his/her patient to make sure the best care is provided.